Hello there, today I have the absolute pleasure in representing Clearly Besotted Stamps Guest Designing for Less Is More. LIM is a great challenge with an amazing Design Team, including the lovely and super talented Sarah, who kindly asked me to take part. Today they are celebrating their 4th Birthday and have asked lots of regular sponsors to take part in their celebrations. The challenge this week is to use the colours pink and grey. For my card today, I am of course, using Clearly Besotted products. I first took the Rounded Tag die and cut this with white cardstock. 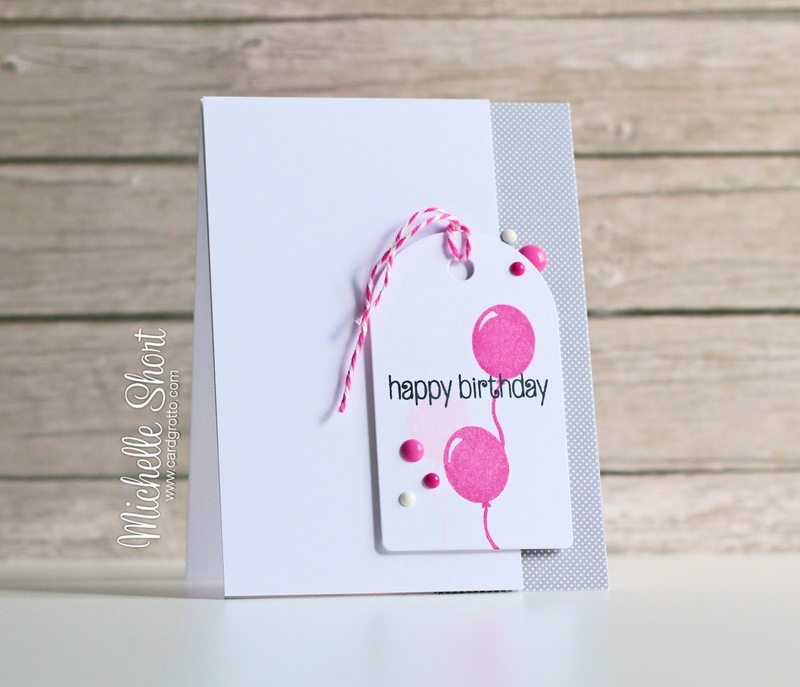 I then stamped the balloons from the It's Your Birthday set on to it using two shades of pink ink. The sentiment, from the new Wild Thing stamp set, was stamped in black and I have threaded some twine through the top. I then took an A2 card base and added a strip of grey polka dot paper to the right side. I also added a panel of white to the left with foam tape. The tag has been adhered on top with more foam tape and the balloons embellished with clear Wink of Stella. I finished off the card by adding a few Doodlebug Sprinkles. Here are the products that I have used on the card. Please click the pictures to be taken to where I purchased it. I have been told that there are lots of prizes up for grabs during this celebration, including a £10 gift card from Clearly Besotted. If you are a CAS card maker, I would encourage you to check out the challenge and have a play. Thanks so much for visiting me today, hope you have a great weekend! We are SO delighted to have you join us this week Michelle... this is a fabulous card, I simply love your style and design flair! Your card is absolutely AWESOME Michelle and CAS perfection. So thrilled you are a GD for us this week and it's such an honour to have you representing CBS. Thanks so much. Gorgeous card, as always, Michelle! Fabulous card design. Love the tag. Awesome CAS card. Love it! This is just gorgeous, love the shine to the balloons. What a gorgeous card! Love your balloons. 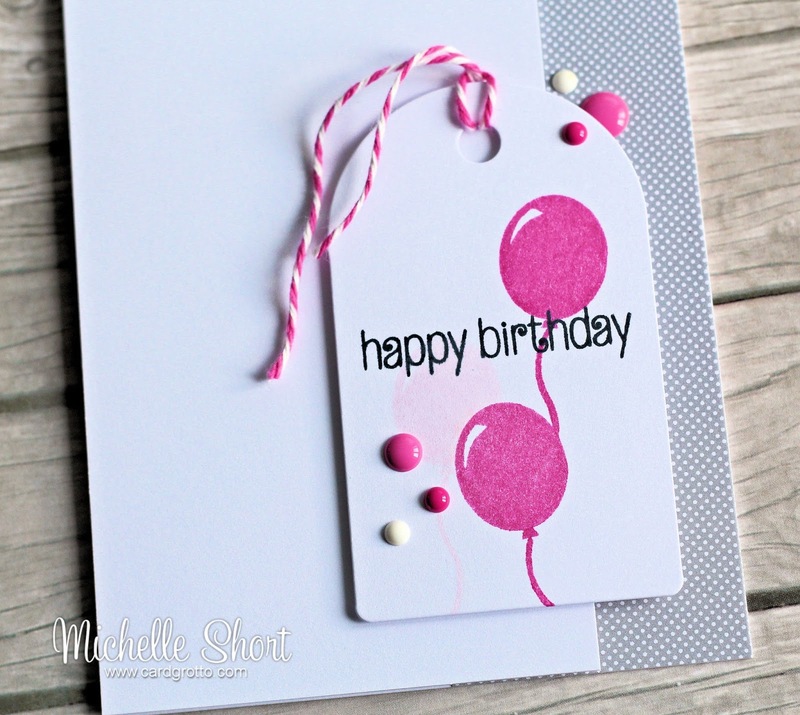 Fabulous card, love the tag and the grey patterned paper is a great effect. Perfectly beautiful CAS card...and so elegantly made! Love it! Loving your 'Tag-on-a-card' effect ! !